To be honest, I love the abalone. Ever since I first saw one as a kid in the 1960s I have been fascinated by this most unusual of snails. Like most people I was first attracted to their taste; abalone are a real delicacy. However, the more I learned the more fascinated I became with them as living creatures. Having been around for at least 65 million years there are about 70 different species, and they are well adapted to their environment: wave-swept shores across the globe. In the cold oceans of the world they feast on nutrient rich kelps and grow to enormous sizes. The world record red abalone is 12.3 inches according to Buzz Owen, a professional abalone diver and the world’s expert on abalone. When you see abalone underwater you quickly realize they are really cool giant snails with complex tentacles sticking out in all directions to sense their environment and a big foot which they extend into the moving water and grabs pieces kelp as it drifts by. As a surfer I was drawn to the black abalone, which lives in the nooks and crevices along the California shore and my fascination ultimately led me into a life of scientific research beginning in 1979. 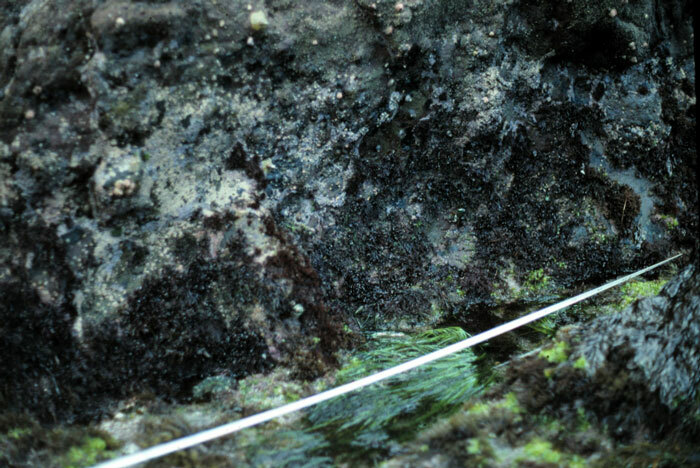 At first I was interested in what they ate and how fast they grew but I gradually became fascinated by their ecology which lead me to the California Channel Islands in the mid-1980s. 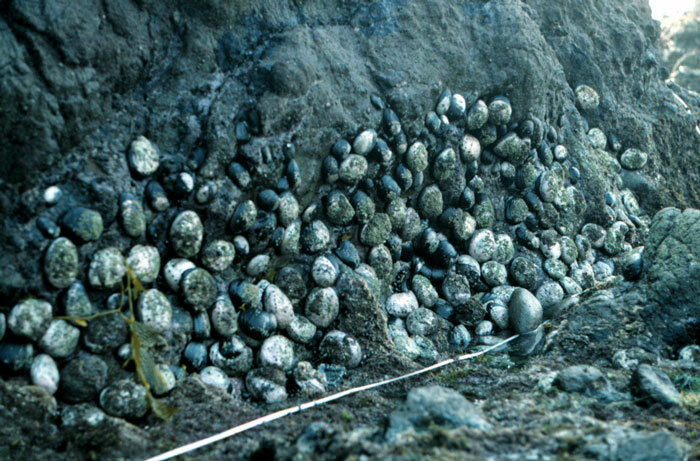 At that time the black abalone was so abundant they literately formed a carpet of snails which covered the shore at Santa Cruz Island where I begin to study them in 1986. Yes, millions upon millions of abalone died in a few short years yet I imagine for most of you this is the first time you have heard of it. Such is the plight of the lowly, and mostly unappreciated, invertebrate. If 1,000 sea lions or sea otters died it would be on the front page of every newspaper but the black abalone disappeared from most of California’s shores with nothing more that a few small articles. As you can imagine it was horrifying for me to watch and very depressing. When I am back on Santa Cruz Island the empty shores, one time covered by abalone, feel barren and haunting. Black abalone are still around but where I used to count thousands of abalone I now find only 1 or 2. 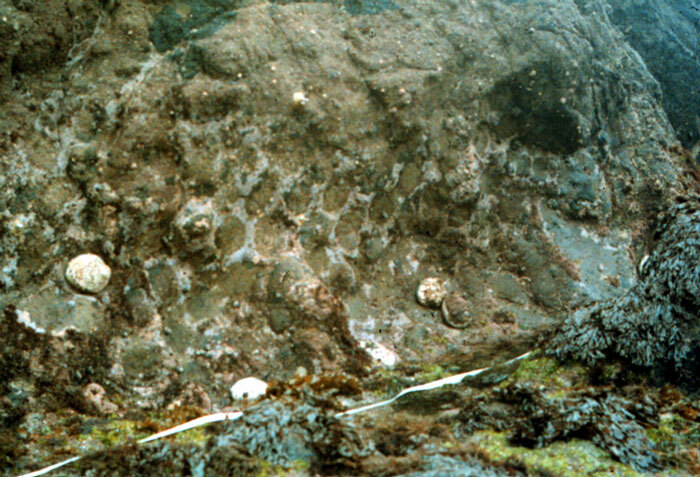 Finally the Federal government took notice and beginning in 2004 I helped work on the science of their diminished status which eventually resulted in the listing of the black abalone on the endangered species list in 2009. One would hope that at some point they will return to their former glory, but it certainly won’t happen anytime soon.